Its objective is the scholarly and practice-oriented discourse on the UN Convention on the Rights of Persons with Disabilities and the 2030 Agenda as well as the Sustainable Development Goals. 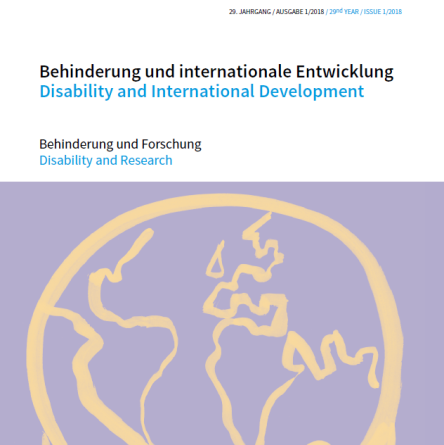 The journal aims at providing a platform for a cross-border dialogue and promoting the professional discussion of related development policy, pedagogical/educational, socio-political and intercultural questions in connection to inclusion of persons with disabilities in countries of the Global South. Each issue is dedicated to a focal topic, complemented by single contributions on other subjects and up-to-date information. While issues dedicated to a focal topic address specific facets of the thematic field, for which in advance a Call for Paper will be published, interested authors are also encouraged to hand in abstracts of own initiative. Here you can find the recent Call for Papers and other relevant information, when you are interested to contribute to the journal through publishing an article.